A flock is a group of animals or birds that live or travel together and, figuratively, a large group of people or things. In religion, a flock is a church congregation. 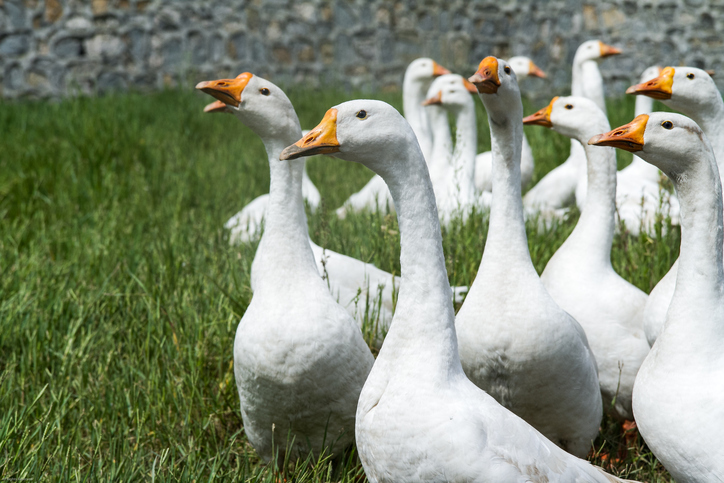 As a verb, to flock means ‘to gather or go in a group.’ Unrelatedly, flock is also wool or cloth refuse, usually used to stuff mattresses or upholster furniture. The verb means ‘to stuff with flock’. A flock of sheep was grazing in the meadow. Flocks of tourists come here in the summer. The pastor addressed his flock. People flocked to the store when it had a big sale. The upholsterer had bags of flock to stuff the seat cushions with. The mattress maker has spent all day flocking mattresses. Flock is mainly used for sheep, goats, and birds. Another word for a group of animals is herd, which is used for cattle (cows) and deer and can also be used for sheep and goats, but not for birds. However, English also has lots of interesting words for groups of specific animals and birds (and even people). A group of crows, for instance, is a murder and a group of owls is a parliament, a group of buffalo is an obstinacy and a group of cats is a glaring, and for people, for example, a group of cooks is a hastiness. You can find several more examples here. Flock, in the sense of a group, dates back to before the year 1000. The Old English flocc and Middle English floc(c) originally meant ‘a group of persons, a company or a troop,’ and was not used for anything other than people until around the year 1200, when the meaning expanded to ‘a group of animals of the same kind moving or feeding together,’ and to a group of domestic animals around the year 1300. It has been used metaphorically to refer to a Christian congregation since the mid-14th century, but its use for birds is recent, first appearing around the 19th century. Its origin is unknown, but it is related to the Old Norse flokkr (crowd, troop or band) and the Middle Low German vlocke (crowd or flock of sheep). Some linguists have suggested that it’s a variation of folc (‘people,’ now spelled folk), but others disagree, since this would be an uncommon variation for English. The verb comes from the noun, and dates back to around the year 1300. The other meaning of flock, wool or cloth refuse, dates back to the mid-13th century. It is also found in other Germanic and Scandinavian languages, but probably comes from the Old French floc (tuft of wool), and can be traced back to the Latin floccus, which meant ‘tuft of wool,’ as well as ‘lock of hair.’ The verb comes from the noun, and dates back to the late 14th century.